The Greg Brown and Friends Event on Jan. 28th SOLD OUT LAST WEEK!! Additional Simulcast Seating due to Popular Demand! A series of talk-show style discussions in which actual participants involved in the spotlight event describe just what was going through each of their minds as the drama unfolded. A live replay of a game that lives in infamy around the Pittsburgh region. 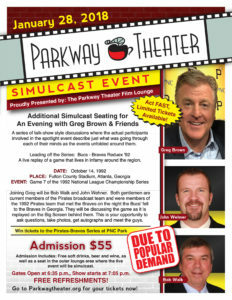 Host Greg Brown, Voice of the Pirates, has invited two friends to discuss what they remember from that unforgettable game, with new revelations & stories that will leave you laughing, crying and amazed! Join Greg and his guests, Bob Walk and John Wehner. Both gentlemen are current members of the Pirates broadcast team as were members of the 1992 Pirates team that met the Braves on that amazing evening in Georgia. The gentlemen will be discussing the game as it is replayed on the Big Screen behind them, and an opportunity to take part in an exclusive question and answer session, plus take photos, get autographs and meet the guys. In addition, you’ll have the chance to win prizes including tickets to the Bucs-Braves Series at PNC Park this Summer! There are a very limited number tickets available and will be sold on a first come, first served basis. So Act Fast. As always, tickets to the Parkway Events make a great Gift Idea. Gates (doors) Open at 6:35 p.m. The show will start at 7:05 p.m. with dinner served before the game! So come early for a front row seat to the “CAN’T MISS event of the winter!